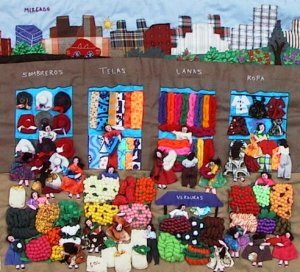 Arpilleras and other Peruvian crafts are available at Lucuma. The company is working with several cooperatives in the Pamplona Alta neighborhood. If a society's art is the best measure of its progress, many of Lima's barriadas—the city's slums—are making giant strides. Andean rugs, puppets and festival masks have long been staples of Peruvian folk art, well known to much of the world. Now new examples of "art naif" are emerging from Peru's slums—works that bespeak of centuries of Peruvian culture and also help scores of families make ends meet. They're called cuadros, "hanging pictures" composed of rags and bits of stray fabric sewn together in a sort of appliqué tapestry portraying scenes of urban and rural peasant life. Their vigor and originality have won a following, and they are now being exported to New York, Los Angeles and Paris. Dozens of tapestry makers are at work in Lima's poverty-ridden shantytowns, most of them women who have banded together in a modern equivalent of the medieval guilds. One of the most prominent groups is the Micaela Bastidas, a 50-member association located in Pamplona Alta, a shantytown outside Lima and named after an Indian heroine who helped lead a rebellion against the Spanish in 1781. "We wanted to so something to help ourselves," says Luzinda Florindez, a mother of three and the group's spokeswoman. "We couldn't afford to sit around with our arms crossed." The women got the idea for the tapestries from similar quilt work done in Chile, but they quickly transformed it into something uniquely Peruvian. Whereas Chilean works are highly political, packed with violence and scenes of oppression, the Peruvian group is much less ideological. Their work is nostalgic, religious and, well, commercial—sometimes to a fault. Drawing on memories of the countryside, the artisans depict rural fairs and harvest, full of bright red apples, yellow carrots and rows of green corn—perhaps a subliminal compensation for the day-to-day scarcity of the shantytowns. Others portray scenes of city life, illustrations of streets teeming with merchants, children going to school, dogs barking at deliverymen. Only occasionally do they inject a touch of social commentary. A squad of policemen might be shown breaking up a hunger demonstration; leftist guerrillas may be seen sabotaging a power station, complete with little red sticks of dynamite. 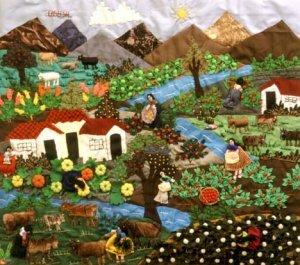 Most of the Micaela Bastidas tapestry makers came to Pamplona Alta in the late 1960s, when their home-to-be was a wasteland of rocks and barren fields. "You would drop a spoon and it would be swallowed up by the sand," says Hilda Quintana, a plump mother of four. From that humble beginning, their progress has been striking. Rather than picking up material in bits and pieces, the group now buys fabric by weight in the central market. "Green is the most difficult to find, and we need it for the fields," says Dona Luzinda, who takes about five days to finish a tapestry. And instead of worrying about simply selling their work, the women are now dealing with a host of foreign buyers. James Plunkett, who runs a handicrafts export house in Lima, took a sampling of tapestries to a Los Angeles gift fair earlier this year. "I shipped about 150 pieces so far," he says, "and interest is picking up." The brisk sales are certainly good news for Pamplona Alta. At Micaela Bastidas, the women split all income evenly, and each sale brings between $5 and $25. That may not be a great deal of money for such expressive works of art, especially when the same articles in New York fetch much more. But for families that might be living in a hut with a cardboard roof, it could mean the difference between a day of square meals and no meals at all.